Four Reasons to Donate—and a Bonus Fifth Reason! 1. We go to colleges throughout six countries—educating students with pro-veg booklets, Animal Equality’s iAnimal virtual reality slaughterhouse videos, and humane education presentations. Question: Do you ever wonder how our staff and volunteers can be on the ground throughout the U.S. and five other countries, representing veganism with a smile and talking one-on-one about going vegan? Answer: Because donors pay to print and ship leaflets, provide food samples, and everything else that goes into making our widespread grassroots activism happen! 2. We are committed to diversity and inclusion. 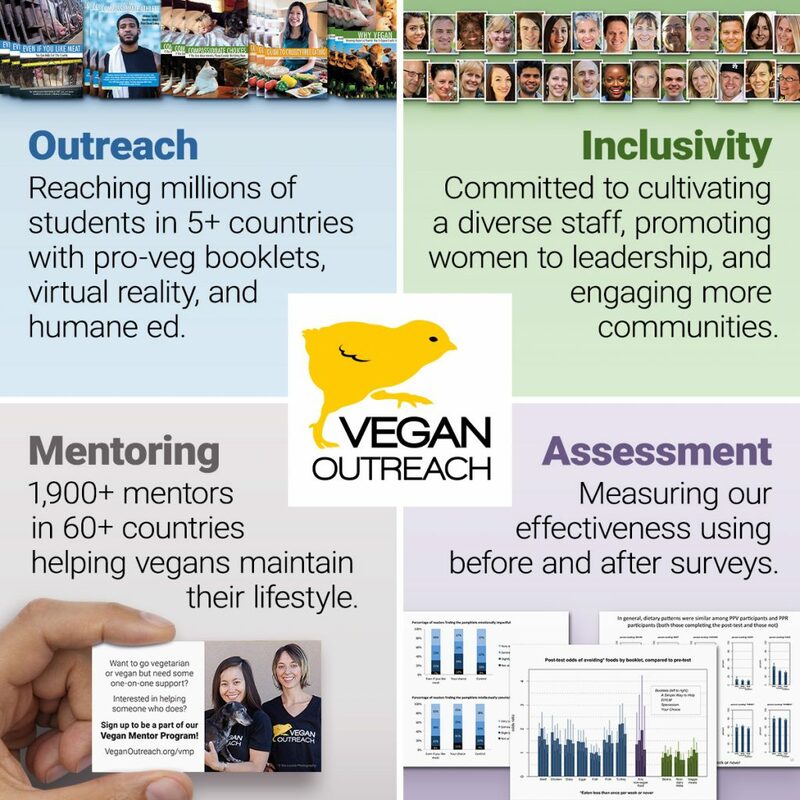 We want to cultivate a diverse staff, promote women to leadership, foster social justice conversations, and engage more communities in learning about veganism. 3. We make connections that help people stay vegan. We have connected more than 2,800 veg-curious people in 60+ countries to individuals who are helping them move toward and maintain a vegan lifestyle. Teaching people about speciesism and introducing them to vegan food is only the first step—these critical social connections will help people cope with family pressure, avoid common nutrition mistakes, and stick with their decision to be vegan. 4. We measure our effectiveness. We want to ensure what we’re doing is what we should be doing. We test our booklets and make improvements to our information and approach. We partner with experienced researchers to conduct measurement studies. As part of our Team Vegan fund drive, your donation will be matched dollar-for-dollar by other donors! Your $20 becomes $40! Donate now to have it doubled!